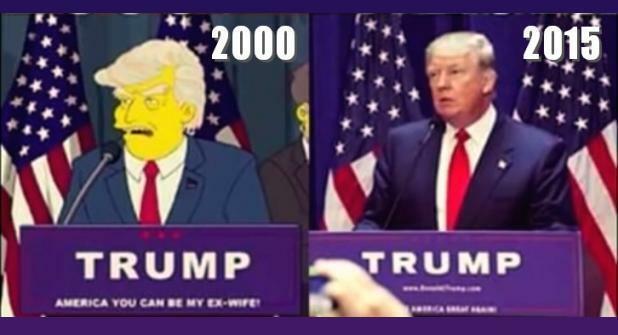 We live in an interesting world where The Simpsons predicted the inauguration of Donald Trump as the President of the United States – a seemingly improbable joke, yet here we are, US President Trump is in power. Ah, good old Simpsons. When we look back at the predictions and reports that call out future events, no matter how improbable they seem, many of us refuse to believe it until it actually happens. I find that this is all too true with the Toronto real estate prices as well, especially if you have been a native Torontonian for 20+ years. The rise of Toronto real estate prices to this point today seemed improbable and impossible back then. Many people with a fixed mindset still refuse to believe it. Some even go as far as creating a narrative for themselves that this isn’t justifiable and a crash is coming (I hate to be the bearer of bad news, but I don’t think a crash is happening anytime soon). News from the Capsule – I stumbled across an interesting article written in the Globe and Mail on February 2nd, 1990 and I wanted to share it with you (see excerpt below). Yes, this article is almost 30 years old! You don’t have to read it all though, I’ll summarize it afterwards. MIND BLOWING!! 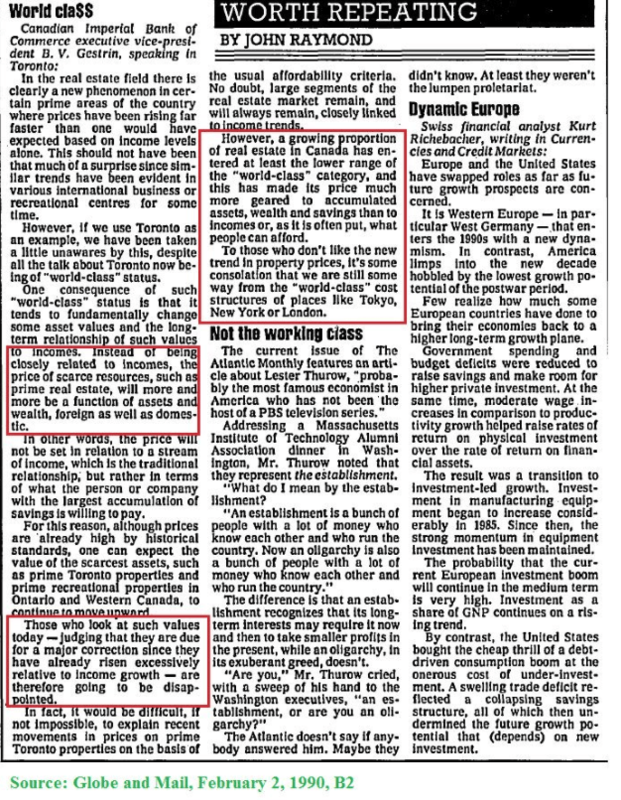 The article essentially predicts exactly what is happening in our economy right now in Toronto… except, can you believe that this was written back in 1990?! In summary, it predicted that prices of real estate will outpace the incomes that Torontoians earn and those who are looking for prices to plummet (since they raised excessively relative to income) are going to be disappointed. Back in the 1990, the article pointed out that we are “still some way from the “world-class” prices of Tokyo, New York or London”. Fast forwarding to present day, we’ve gotten pretty close now and we will continue to close the gap. Déjà Vu – For anyone who doesn’t remember or didn’t follow real estate back then, the year 1990 marked the start of the biggest Toronto real estate crash to date. Within 1 year, prices dropped 8% and continued to decline until about 1996 (Does that sound familiar?! Hint: 2017). I know many horror stories of families getting wiped out financially because of this. People who read that article 30 years ago must have thought the author was crazy, especially since the prices were drastically dropping. Look at where we are now. Income Growth is FLAT! Of course, one could argue about the low-interest rates and how easy it was to qualify for a mortgage after the crash, but that is besides the point. The point is that incomes DO NOT grow as fast as real estate prices, period. Here is a scary graph that I used in my previous Insight Article, “The Uncatchable Wealth Gap” about half a year ago that plots the growth of the average income against the growth of real estate in the Toronto. It’s a pretty scary looking graph. Don’t get fooled though – that gold line on the bottom looks like the X axis of the graph, but it is actually the trend line representing the growth of average income. That gold line looks quite flat doesn’t it? It’s a scary world we live in. You can see that the only dip in real estate prices was in the early 1990’s, circled in red above. This dip was exactly when the article from 30 years ago was written. 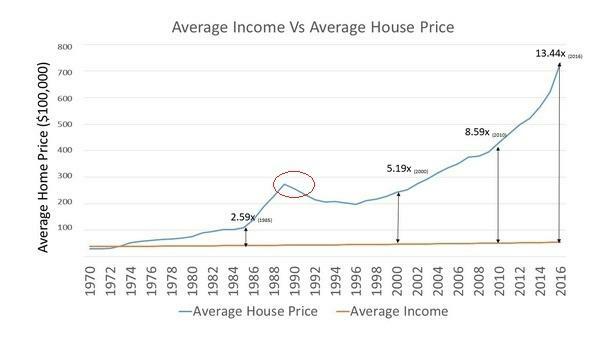 Today though, looking at Graph A, we can see that the average home is over 13x the average income right now, which is significantly higher than 4x in 1990. Higher Prices, Less Space – Furthermore, to add insult to injury, the entry level home is now a condo which means the size is significantly smaller as well. This is something that we all must adjust to as Toronto continues to grow and we push towards the housing class that offers the most affordability. Affordability Indicator – Here is some more craziness that nobody talks about as well. 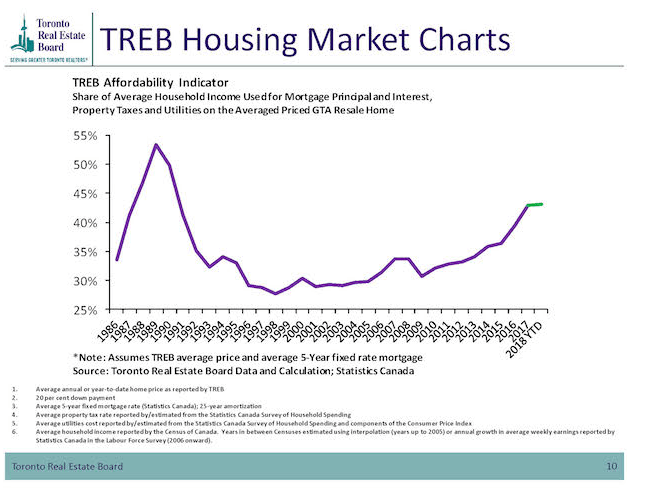 Have a look at Graph B below for the affordability indicator tracked by TREB. Back in the late 80’s, before the crash happened, people were using almost 55% of their household income to pay for housing. Today we’re only at ~45%. More room to go? The Wrap – As improbable as the future sounded in that article from 1990, it all eventually came true. As improbable as it is for me to say that prices will continue to rise, I truly believe this will eventually happen, especially when you factor in population growth, foreign income, immigration, the green belt and the blossoming of Toronto as a World Class City. It has never been more urgent to own hard assets such as real estate in order to protect yourself from getting out-priced in the coming years. Do it now, before its too late. Next Next post: How to Capitalize on the Upcoming Rental Blood Bath!